If you love anything with eggplant, you'll surely enjoy this flavorful Turkish appetizer, or meze, called şakşuka (shahk-SHOO-kah). 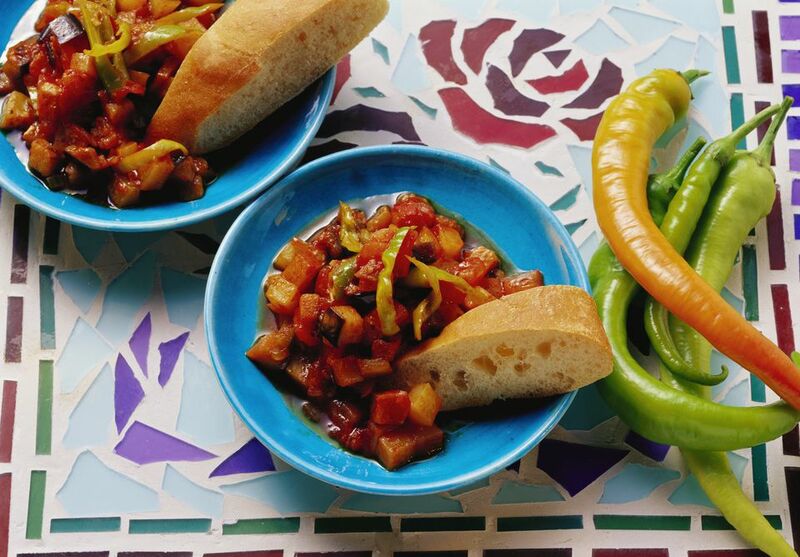 Şakşuka is a vegetarian medley of eggplant and zucchini squash, fried in olive oil and mixed with a tomato sauce made from green and red peppers, onions, and garlic. This makes a thick, spreadable mixture that is delicious as a starter or side dish with grilled meats, and as a topping for grilled hamburgers and chicken breast. It even works as a spread for melba toast or crackers! It's a versatile dish you can make all year round with any vegetables that are in season, as long as the main ingredient remains eggplant. You can make şakşuka as mild or as spicy as you like. Simply substitute sweet peppers with hot pepper varieties and add some hot pepper paste or hot pepper flakes to the tomato sauce before mixing it with the vegetables. Some people like to use a lot of tomato paste to make the sauce thicker. I prefer to cook down fresh tomatoes to make a lighter, less acidic sauce. If you don't have much time and need a shortcut, you can substitute the tomato sauce with mildly-seasoned, jarred pasta sauce. Şakşuka is easy to prepare, just make sure you have plenty of paper towels on hand to drain the fried vegetables well. The eggplant will absorb a lot of oil during frying, and too much can weigh the dish down. Before serving, şakşuka is topped with generous amounts of creamy, whipped plain yogurt seasoned with garlic. Prepare the eggplant: cut off both ends and using the edge of a vegetable peeler or a paring knife, remove the skin in alternating strips going from top to bottom. Do this gently, saving as much flesh as you can. Cut the eggplant into bite-sized rectangular chunks about 2 inches long. Put the chunks of eggplant in a large mesh strainer or colander and salt well, turning with your hands to salt all sides. Let the salted eggplant rest for about 15 minutes while you prepare the other vegetables. This removes the bitterness. Coarsely dice the peppers, red onion, and squash. Once the vegetables are ready, pour about two inches of oil in a deep frying pan or saucepan and turn the heat on high. While the oil is heating, wash the eggplant in the strainer with cold water, turning it with your hands, until the salt is removed. Drain it well and blot off the extra water with paper towels before you fry them. Fry the eggplant until tender and just beginning to brown at the edges. Do the same with the squash. Strain out the fried vegetables and drain them on a thick layer of paper towels. Let them sit for several minutes to make sure as much oil as possible drains away. In the meantime, put two tablespoons of olive oil in a skillet and fry the onions, garlic, and peppers until tender. Add the tomatoes, tomato paste, sugar, salt, and pepper. Cover and reduce the heat to low. Let the sauce simmer until the tomatoes are soft and begin to break down. Remove the lid, stir it well, and let the sauce simmer until most of the liquid is reduced. It should be the consistency of jarred pasta sauce. In a mixing bowl, add the eggplant, squash, and tomato sauce and stir together well. Put the şakşuka in a serving dish and chill for several hours. Just before serving, spoon generous amounts of garlic yogurt over the top.